The Managing the Creative Mindset Course is an internationally-recognised creativity training course with a solid foundation in the neuroscience of creativity: in other words, the science of how the brain works when we conceive new ideas and solve complex problems. CINC researchers have spent the last decade investigating how the brain works when people are creative. This knowledge, combined with insights from psychology and behavioural science, informs the tools and techniques we use to enhance creative thinking. Once we understand the cognitive processes involved wíth creativity, we can increase our creative capacity. Participants will learn how creative awareness and techniques can be applied to solve any kind of problem. To achieve this, participants are first introduced to the underlying mechanisms of what is commonly known as creativity. They will then learn how to utilize their existing knowledge and any domain expertise in a more creative way, building personal creative competencies as well as collaborative creative skills. The courses are taught at CINC’s training facilities, and participants come from a wide variety of sectors and backgrounds, and are mixed in diverse groups. Open courses are also brilliant networking opportunities. Price includes, two days training, lunch, snacks, and certification. The format is based on the ‘studio teaching’ method: short lectures followed by multidisciplinary team work with close supervision. The full course takes 12 hours, where the first 3 hours is preparatory homework done as e-learning while the remaining 9 hours are taught in-class over a 2 day period (3+6 hours). Background materials to be reviewed before the course. For more details about the course, contact us directly at booking@neurocreativity.dk. Read about the course foundations in this article: Onarheim, B., & Friis-Olivarius, M. (2013). 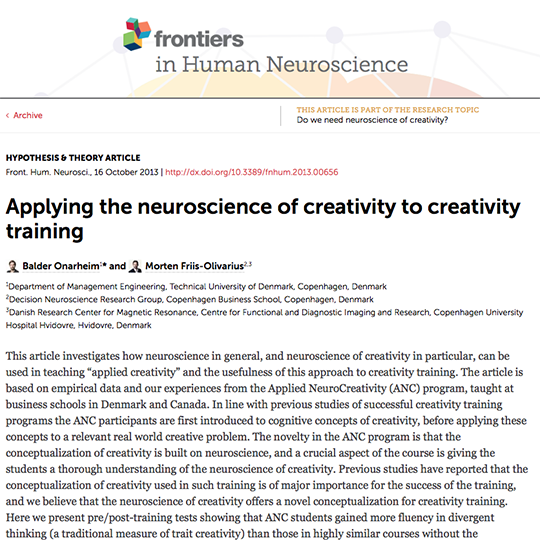 Applying the neuroscience of creativity to creativity training. Frontiers in human neuroscience, 7. 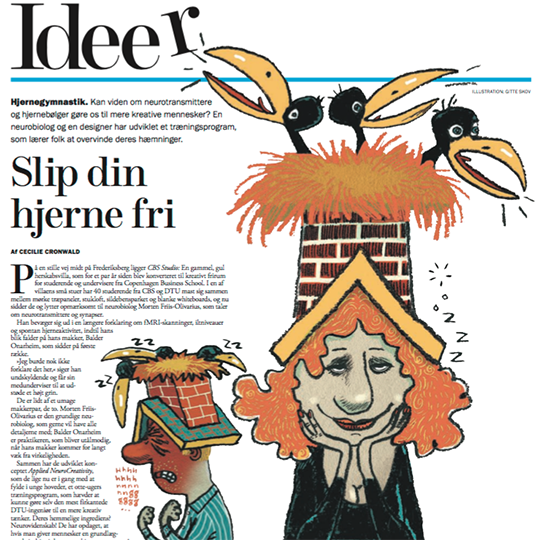 "Slip din hjerne fri" ("Release your brain”) Article in Danish newspaper Weekendavisen about the program.